Michael Collins, the ‘Soundest Bloke’ in history. 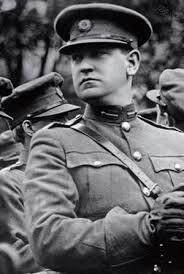 A nationwide survey of Irish teenagers between the ages of eleven and twenty-two has found that a majority feel that legendary Irish revolutionary Michael Collins was the ‘soundest bloke’ (ie coolest gentleman) in history. War hero Collins, who died in 1922, defeated the likes of former US President John F. Kennedy, Indian spiritual leader Mahatma Gandhi, English anti-parliamentarian Guy Fawkes and the fellah who played ‘Fonzie’ on popular American sitcom, ‘Happy Days’, to top the poll. The study, carried out in 812 secondary schools in all of Ireland’s thirty-two counties, as well as the disputed border regions of East/West Wexford, took almost two hours to complete, with most schools closed down in the weeks leading up to the historic event. Sponsored by ‘Kerrygold – Bringing Butter from the Cow’s Bits onto Your Bread for Nine Centuries’ and Monica’s Bridalwear (Kilkenny branch), the survey also determined that the ‘biggest ride’ in history was controversial French queen, Marie Antoinette, who once uttered the immortal line: ‘Ah lads, are yis after eatin’ all the biscuits’, when informed that there was no cheese left for her peasants to nibble on. Utterer of the immortal line: ‘Are there any biscuits left lads?’. – Marie Antoinette. 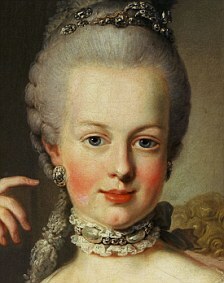 Other leaders in the ‘biggest ride’ (ie prettiest individual) category, were: Marie Antoinette’s fellow French native Joan of Arc, Henry VIII’s headless first wife Anne Bolyn (but when she had a head, of course), iconic Japanese princess and inventor of the pyramids, Cleopatra and pop singer Belinda Carlisle, who narrowly defeated Russian mystic Rasputin into sixth place. Villains of history were voted as being (in order): Attila the Hun; Vlad the Impaler (the inspiration for Dracula), Russian Tsar Ivan the Terrible, Mongolian leader Genghis Khan and Mary Harney, Ireland’s former Minister for Health. The poll has been deemed an extraordinary success, with youngsters throughout the land claiming to have discovered a new-found interest in history. ‘We’ve discovered a new found interest in history’, said one young man, Alfred Fox (23), who lied about his age so he could complete a questionnaire at his son’s school. Students across Ireland are now said to be reading books about the Russian Revolutions, The Spanish Civil War, the Reunification of Germany and that thing in the 1980s in Kerry, when a load of oul’ ones thought that they saw the Virgin Mary’s face in a bag of Maltesers (they were the ones that melted in your hands, not in your mouth, or something). Words by Bosco Coppell. Pictures thanks to Dermot’s Fishing Tackle.